The bowls you love, now with a new look and better suction! Let's face it. 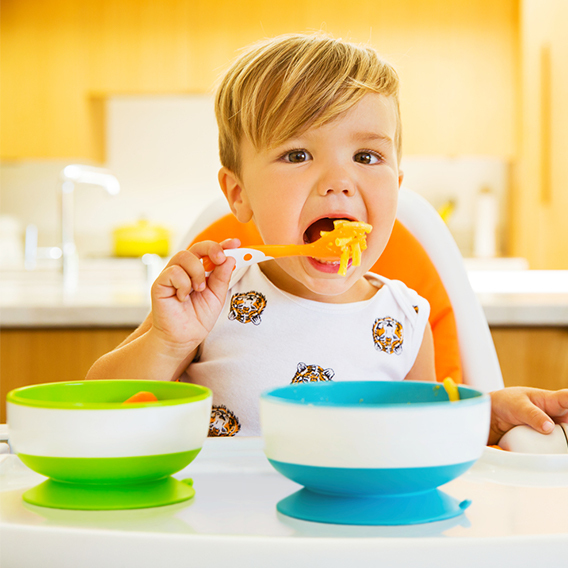 Toddlers can get a little rambunctious at dinner time (make that all the time). But you no longer have to duck for cover from a flying bowl of macaroni & cheese. Minimize unnecessary messes with our convenient three-pack of Stay Put™ suction bowls. The strong suction base will adhere to most surfaces, and the quick-release tab makes removal easy for adults. Microwave and top-rack dishwasher safe, food prep and clean up is easy and quick, too. Now if only you could keep your toddler in place so easily!